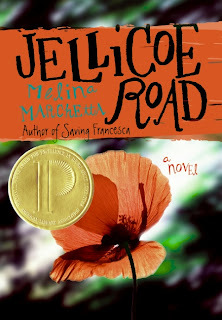 I loved Jellicoe Road. It's one of my all-time favorites. I was totally lost for the first half, but I stuck through it and everything came together. I immediately re-read it once I finished the book. I can't remember the last time I did that. Everything made so much more sense the second time and was even more emotional and beautiful. For me, this is one of the best books ever. Melina's writing always leaves me feeling a little raw inside. It's not a sad feeling at all, just this sense that I've gone through a lot while reading her books. Jellicoe is amazing that way. I agree there are a ton of characters, but like you said, you get the hang of it quickly enough. sooo glad you liked, i LOOOOVE this book!!! Perhaps my favourite YA book ever :) great review! and Melinas other books are so amazing too, esp. the contemp ones! Awesome review! I absolutely loved this book, and I agree that Marchetta is so good at writing emotions. I definitely need to read the rest of her books! This is one of the best books I have ever read. I loved your review - it captured the beauty, the emotion and the relationships behind the story. This is my favorite of all of her books but I absolutely adored Saving Francesca and Looking for Alibrandi as well. I can't wait for The Piper's Son to be released in March. I have heard such great things about Finnikin of the Rock. Melina Marchetta is a gifted author with a real talent for writing authentically. I am so glad that you loved Jellicoe Road. I cannot say enough good things about this book.